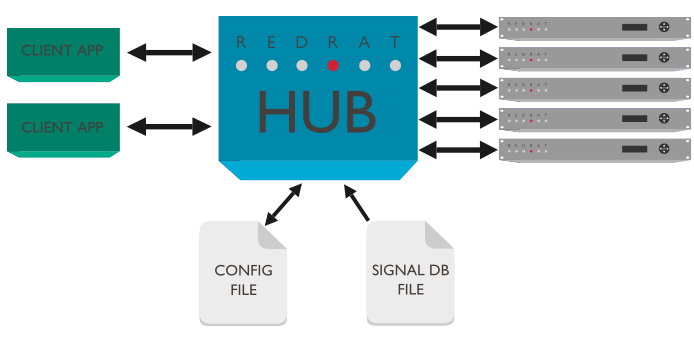 The RedRat Hub is an application that manages communication with RedRat hardware. Normally RedRat devices are controlled directly via applications provided by RedRat Ltd (e.g. Scheduler or TestManager), third parties or by software developed using the RedRat .NET based SDK. Sometimes these alternatives are not suitable, so RedRat Hub has been developed to provide additional flexibility. If your software or system does not integrate easily or well with .NET, then using RedRat Hub allows control using simple commands sent via a TCP/IP socket. If you need multiple applications to communicate with an irNetBox or RedRat-X, the Hub can act as a multiplexer. If you would like to control a USB RedRat3 device from a remote computer, RedRat Hub allows connections via a network. RedRat Hub is based on the core RedRat SDK .NET code, but will run on both Windows .NET CLR (V4.5) and also on Linux using Mono. Client applications connect to RedRat Hub on a socket and send commands (as UTF-8 strings), which are then interpreted and the appropriate instruction sent on to a RedRat device. The Hub can take connections from multiple clients and ensures that they are handled appropriately for the RedRat hardware, for example with an irNetBox-II, the complete output operation sequence has to be completed before another operation can be initiated whereas with an irNetBox-III, multiple operations can be performed simultaneously where there is no overlap in output port usage. When a command is sent to RedRat Hub, that connection will effectively wait until the operation has been completed before returning either success or failure. This allows the client application to step through a set of operations at the rate at which they are being executed. If a client application needs to send multiple commands at the same time, it can then open multiple connections to issue these commands. On start-up, the Hub loads the IR signal data file which is then used as the IR data source. It can also optionally load a configuration file, which is can be saved and re-run at runtime by issuing the appropriate commands. Signal data file 1: Name of XML or TXT signal data filename. At least one file must be given. ––quiet : Prints out very few details of operation.––verbose : Prints out verbose details of operation. ––debug : Prints out even more information. ––port : The port to use for client connections (default = 40000). ––conns : The number of required client connections (default = 20). ––noscan : Do not search for RedRat hardware once started. ––config=file : Load configuration from file. At least one signal data file must be specified, either in device database format (xml) or irNetBox format (txt). When loading irNetBox signal files the dataset name is taken to be the file name without its extension, so signals within stb.txt would be referred to with the dataset stb. The ––quiet, ––verbose and ––debug switches may optionally be provided to select more or less program output respectively. If many client applications are to be used, for example one client per IR output port on many irNetBoxes, then the ––conns switch is used to increase the number of simultaneous client connections that can be handled. If the number of client connections exceeds this value, then client connections will be queued and serviced once a connection becomes available. By default the hub will scan for RedRat devices once it has started. This can be disabled using the ––noscan switch. Configuration may be loaded from a file once the hub has started using the ––config=”file” switch. The hub uses a TCP socket interface to accept commands on port 40000 by default. Commands are sent to the hub in plain text as UTF-8 strings. The general format is a list of one or more key=”value” statements separated by spaces and terminated with a line feed (n) character. Statements may be in any order and are not case sensitive. Multiple commands may be sent through a single connection or through multiple connections from different clients. The hub makes a connection to an irNetBox or RedRat-X only when needed, typically once the first signal transmission command has been received. Once a connection has been established it is held open until the hub closes or a disconnection command is received. See commands section for more details. RedRat3s are USB devices and can be used by multiple client applications simultaneously, so the Hub may share control with any other applications on the Windows computer. Control of USB RedRat3 devices with RedRat Hub is currently only supported on Windows and not on Linux. By default the hub may connect to any RedRat device that it discovers. A RedRat device can be blacklisted to prevent the hub from connecting to it, which might be useful if the device is under the dedicated control of some other program that must not be interrupted. Blacklisting and whitelisting some or all RedRat devices can be done using hub queries, detailed below. Clients connect to the hub via a socket interface on TCP port 40000 (by default) and are free to disconnect any time thereafter. The hub will only disconnect clients when it closes. The hub automatically alternates transmission of toggle signals and double signals. Toggle state is managed by the hub on a per-signal and per-output basis so that each AV device will see the correct alternation of signals. In this context, however, per-signal refers to the complete signal data rather than just the signal name. Thus, a signal with a repeat descriptor is a different signal to the original. Equivalently, a signal with a repeat count of 2 is different to one with a repeat count of 3 and so on. Hub queries, which allow interrogation of the hub’s state or instruct it to perform some action. RedRat hardware queries, which are used to return information about a particular RedRat device. Instructions to output IR signals via RedRat hardware. list datasets – returns the list of IR signal datasets loaded from the signal files. add ir-file – adds a new IR dataset file (XML or TXT) to the IR data used by the application. If there are datasets with the same name as existing datasets, then old data will be overwritten. Requires the file parameter. (See section Configuration for more information). load ir-file – Loads a new IR dataset file, replacing (and deleting) any IR dataset information known by the application. Requires the file parameter. (See section Configuration for more information). add redrat – add a RedRat to the list of devices known to the hub. Requires that the device is identified with [identifier]. remove redrat – remove a RedRat from the list of devices known to the hub. Requires that the device is identified with [identifier]. connect redrat – forces RedRat Hub to connect to the given RedRat. It usually only connects on demand. Requires that the device is identified with [identifier]. disconnect redrat – closes the connection to the given RedRat. The connection will be re-established on demand, or can be forced with the connect redrat command. Requires that the device is identified with [identifier]. save config – write the current state of the hub to a file. Requires the file parameter. (See section Configuration for more information). load config – configure the hub by running commands in a file. Requires the file parameter. (See section Configuration for more information). firmware version –returns the version of the firmware running on the given RedRat device. reset – resets the main microcontroller. This is not supported for the irNetBox-I & II and does not reset the XPort module on an irNetBox-III. reset nic – resets the network interface card for an irNetBox. [output descriptor] – which output(s) and power level(s) to transmit the signal on when using an irNetBox or RedRat-X – see Output Descriptor below. [repeat descriptor] – how to repeat the signal, if at all, described in Repeat Descriptor below. An output descriptor specifies one or more outputs and, optionally, output power, to use when transmitting a signal. Examples of the syntax follow. It is important to note that different versions of the irNetBox have different capabilities when setting output power. The mark II has 3 output power levels (low, medium and high) whereas the mark III is continually adjustable. When using older hardware the hub will choose an output power level closest to the one requested. Requesting 40% power will result in 40% on a mark III but only 33% on a mark II. The default output power is 33%. repeats=”n” – set the repeat count for this signal to the integer n, not larger than 255.
duration=”T” – calculate the repeat count such that the signal is transmitted for T milliseconds. An error is returned if the calculated repeat count exceeds 255. When loading IR datasets, or working with configuration information, file names need to be given. The form is: file=”filename” where the filename may need to be the full path if not in the directory in which RedRatHubCmd.exe was started. The hub can be configured by running a sequence of commands from a file. Any of the commands detailed herein may be used and the format is exactly the same. When the save config hub query is invoked, the hub will write out the sequence of commands required to restore any RedRat devices added manually, including whether or not these devices have been blacklisted. Devices discovered automatically, e.g. via the find redrats hub query, are not saved. As automatic generation of config files is quite limited, users are encouraged to review and modify the contents of config files to fit their requirements. Each line of the config file should contain a single command. Lines beginning with # are treated as comments and ignored. Configuration may be loaded when the hub is started using the ––config=”file” command line option and can be (re)loaded at any time with the load config hub query. Identifying a RedRat device by MAC address didn't work. Now fixed. RedRat-X support added for the command "reset nic". Fixed startup race condition causing application to hang on Linux. Command line arguments no longer case sensitive. Console log output visibility improvements. Improved MAC support for UDP broadcasts and XMOS USB device discovery. Connections are now closed to RedRats that are removed using the remove redrat command. Bug fix: Cached RedRat now cleared whenever disconnected, not just through disconnect command. Front blaster is used if no output is specified for RedRat-X. Added command to reset the network interface card for an irNetBox – ‘reset nic’. Added timestamps to console output. Improved speed when using multiple outputs on a MK-II irNetBox. Bug fix: Various hubquery commands didn’t work when using the irNetBox name rather than IP address. Added support for continuous IR output. Added hardwareQuery commands – connect, disconnect, reset and resetXPort. Updates to core RedRat comms code. Some improvements to debug output. Fixed issue with TCP connection locking that caused problems running under Mono. Repeat and duration options added for long IR signals. Toggle and double IR signals are better supported, especially for async output via the irNetBox-III. Updated to use .NET 4.5. Added the support for Linux/text IR dataset files. Added –noscan on startup – it will then not scan for irNetBoxes. Added loading and saving of configuration files. Added runtime loading of IR signal datasets. Considerable improvements in performance and robustness. Some changes to the commands for consistency. There may be some irNetBox connection issues when running under Mono.